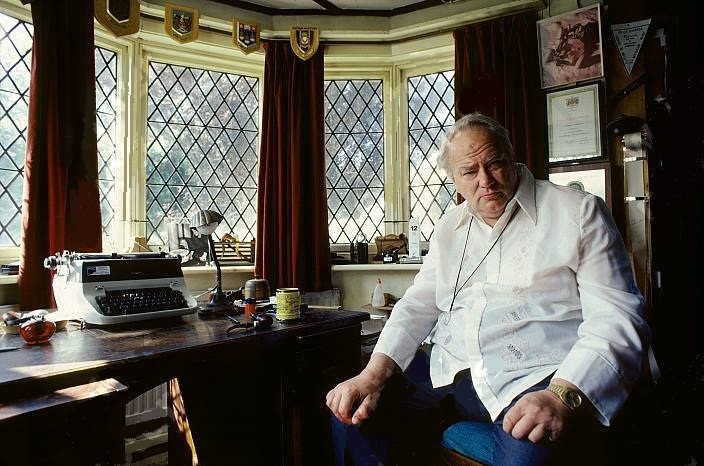 Legendary eccentric English astronomer and cat lover Sir Patrick Moore (1923-2012) was the man who mapped the Moon before Man had even stepped foot on it. Indeed, his map helped Man step foot on it. Moore was also the only person to ever meet Orville Wright, Yuri Gagarin and Neil Armstrong. 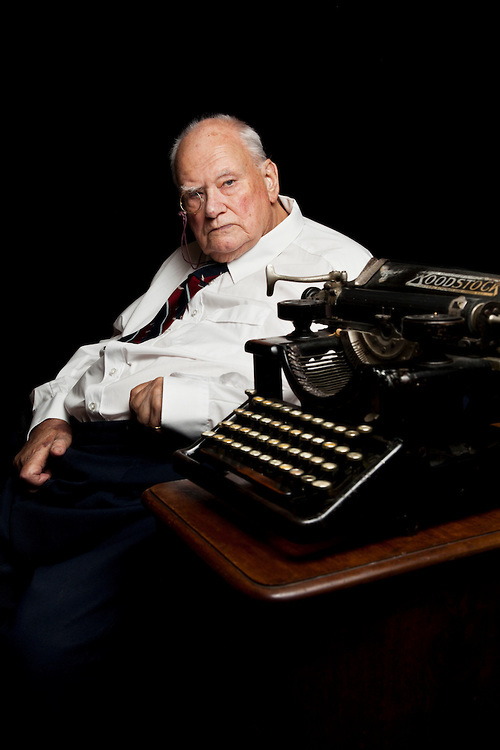 Moore famously despised computers and used an early Woodstock typewriter to write more than 100 books (he lost count of the precise number), articles, reports and letters until well into his late 70s. In was not until late 2001, when wartime injuries finally caught up with him one horrible morning, that he had to stop typing at the rate he had once managed. A week ago Queen guitarist and astrophysicist Brian May announced on his blog that he planned to sell the charming thatched home of his late friend Moore. May said he was selling Farthings, in Selsey, after proposals to turn it into a Moore museum fell through. Moore's Woodstock in April 2012, eight months before he died. Profits from the sale of Farthings will go to the South Downs Planetarium in Chichester, which hopes to convert derelict buildings on its Kingsham Farm site to create a study centre using Moore’s books and observations, alongside a museum and astronomical garden. May bought Moore’s home in 2008, leasing it back to him for a peppercorn rent the same day, to provide financial security when the hugely popular - but by then largely incapacitated - The Sky at Night host fell on hard times. 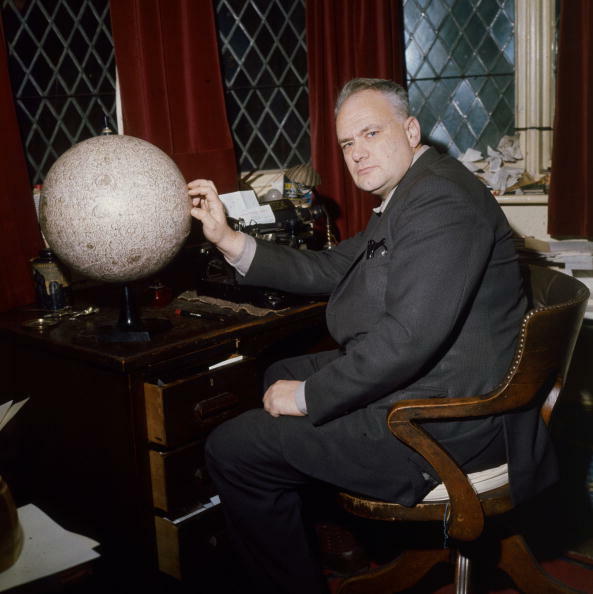 John Mason, principal lecturer and founding trustee of the planetarium, said the study centre would contain "the biggest astronomical library in private hands outside the Royal Astronomical Society in London", with "the ambiance of Sir Patrick’s library". Whether Moore's Woodstock typewriter will help provide some of this ambiance is not yet clear. Indeed, the whereabouts of the Woodstock used by Moore for most of his life appears to be something of a mystery. Earlier this month, Moore’s personal belongings fetched tens of thousands of pounds at a Chichester auction. These included what purported to be Moore's typewriter, an item which sold for £550. 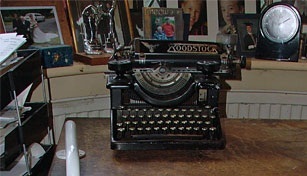 However, the typewriter which was sold was a Remington 8, a wide carriage version of the 7, and NOT Moore's Woodstock. Has someone been sold the wrong typewriter? Last December, on the second anniversary of Moore's death, it was reported that the Science Museum in London had acquired a large collection of his objects and manuscripts and memorabilia, including The Sky at Night scripts, and about 70 of his observation books, stretching over more than 60 years, manuscripts for astronomy and fiction books, and a 12.5 inch reflecting telescope. It's possible the Woodstock typewriter may have been among that lot. Mason at Moore's Woodstock in February this year. 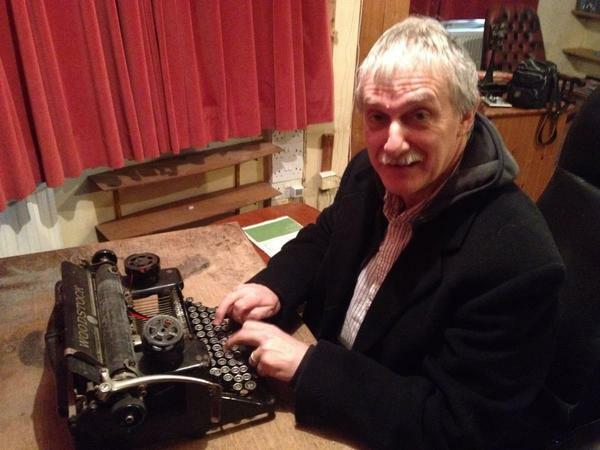 But, on February 23 of this year, the South Downs Planetarium's John Mason was at Moore's house to record Moore's Woodstock typewriter for a BBC Radio 4 drama, "Far Side of the Moore". Mason said that even using 10 fingers, he could not type as hard or as fast as Moore could with two. 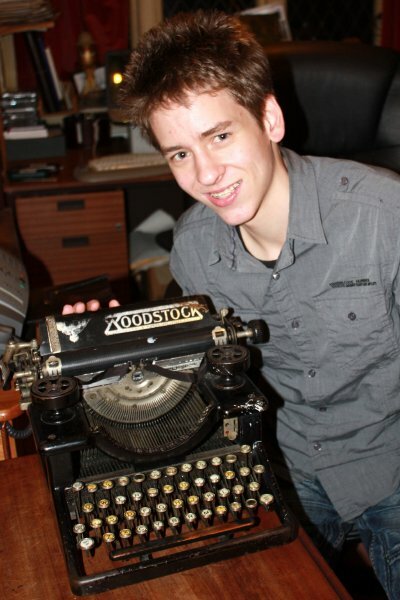 The fact that Mason was able to type on the Woodstock at all is interesting, because on January 15, 2008, a plea had gone out to Britain's amateur astronomers from Chris Lintott, to "Save Patrick Moore’s Typewriter": "Patrick Moore’s Woodstock typewriter is broken and no one knows how to fix it. Do any of you know?". Items sold by Henry Adams Auctions in Chichester earlier this month included Moore's xylophone, orreries (clockwork models of the solar system) and signed books. 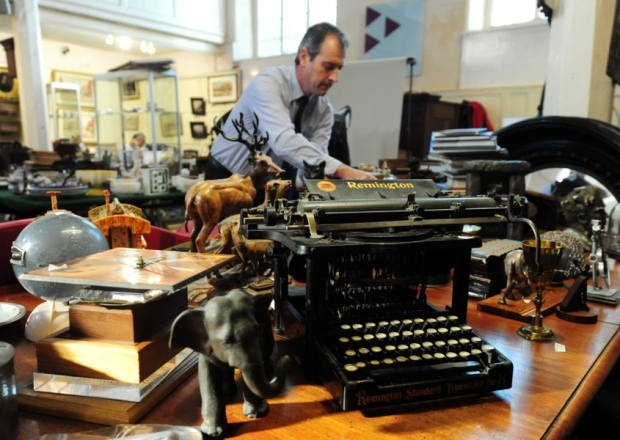 Auctioneer Andrew Swain reported, "There was also a lot of interest in Sir Patrick’s typewriter which sold for £550." 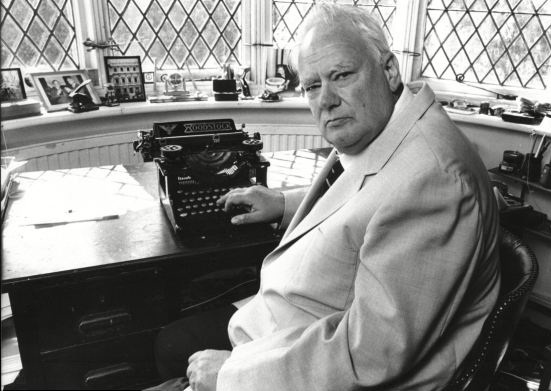 Moore died in Selsey on December 9, 2012, aged 89. By that time he hadn't set foot in his observatory for more than a decade. He couldn't get up the steps or walk across a room. Worst still, he told a reporter on March 4, 2011, on his 88th birthday, he couldn't "even bash out a letter on his typewriter or hold a pen". Some time in late 2001, he woke up one morning to find himself crippled by a spinal injury that had troubled him since World War II. The right side of his body was largely immobile. 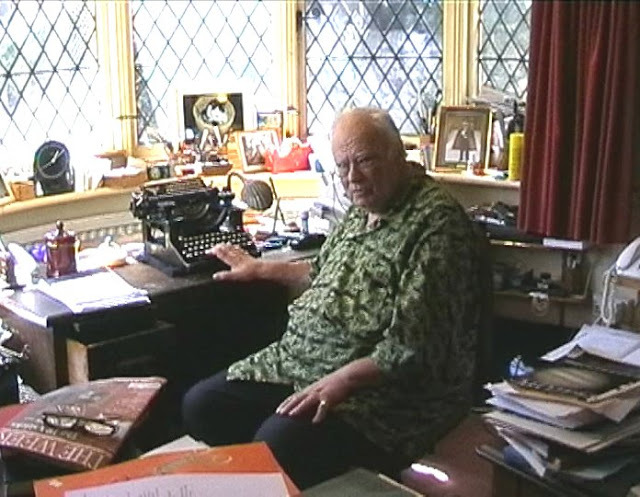 At the time of his 88th birthday, Moore said: "I can't use my dear old typewriter on which all my books have been written." 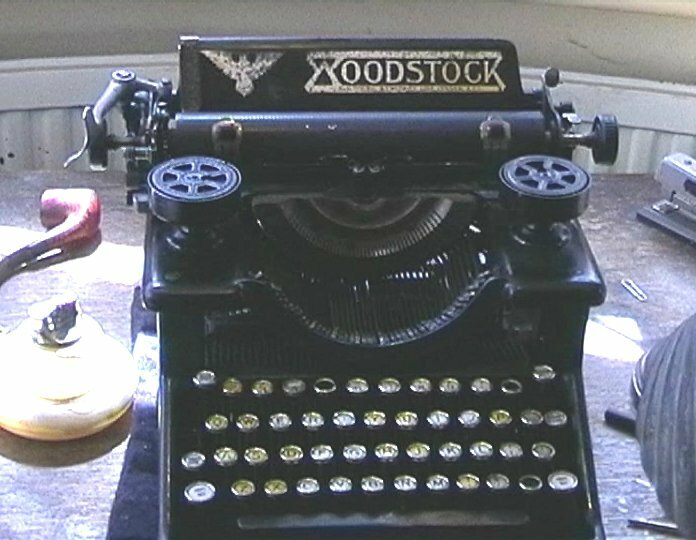 Although the model number on the front of his Woodstock had long since worn off by 2008, when the photo above was taken, the first Woodstock did not reach the market until September 1914. 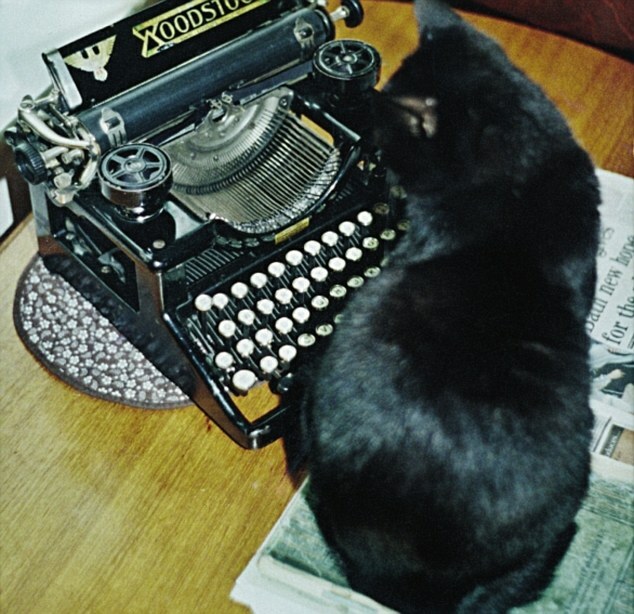 Eight months before he died, Moore published a book (Miaow! Cats Really are Nicer Than People!, interesting nine-minute video in which Moore talks about the book here) about his cats and donated the profits to Cats Protection - the full story can be read here. From It Came From Outer Space Wearing an RAF Blazer! 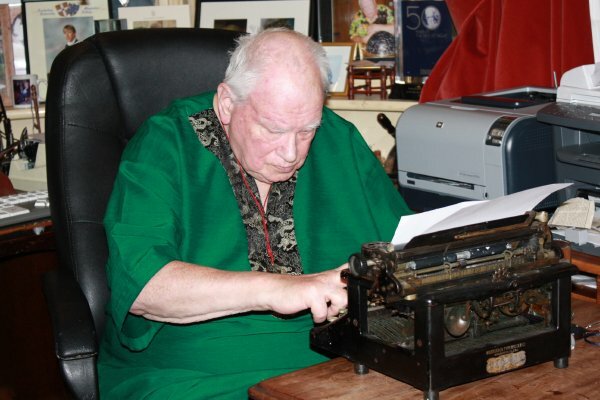 A Fan's Biography of Sir Patrick Moore by Martin Mobberley. An excellent and interesting story. And: hooray for the continuation of oz.Typewriter!! Robert I loved the video. Thank you for sharing it. I'm delighted your wonderful blog will continue. And about the Russian brides...my wife said I'm not allowed to have one. Great story, Robert. I've dabbled a bit in amateur astronomy, and can understand why the moon would be so fascinating of a subject, not requiring extraordinarily dark skies to appreciate, nor such a huge light bucket of a 'scope. Congrats on getting the blog back on the air. Now it's our responsibility, your readers, to be more faithful to comment on your articles. My wife says that Russian brides are too high maintenance. She's always so practical! Wow, 200 books banged out on that Woodstock? Amazing! Typing at those speeds with only two fingers demonstrates a long history of use with that one machine, despite owning several others. I hope to form a similar bond with mine. 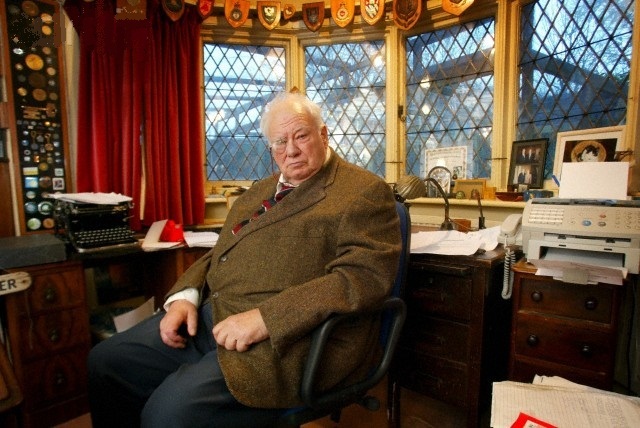 He's the spitting image of Winston Churchill! And, of course, how wonderful that you won't be leaving us any time soon! Very interesting fellow. I love his writing room. I think it is larger than my entire tiny house! I wonder..What happened to the Woodstock. Good to see you will be keeping your blog going. It is one of the best and one of my favorite. Wonderful article about Mr. Moore! And even more wonderful news about the blog's reprieve! So pleased to hear that you will be continuing with your blog ! Delighted, actually ! Regarding Russian brides, since many are qualified engineers, I always thought it might be a good idea. She could service your car and clean the lathe down for you before cooking your dinner...........!